After the mainstream martial arts action of both Bloodsport & Kickboxer, audiences were in for a shock with the release of Jean-Claude Van Damme’s 2nd leading role for Cannon Films. 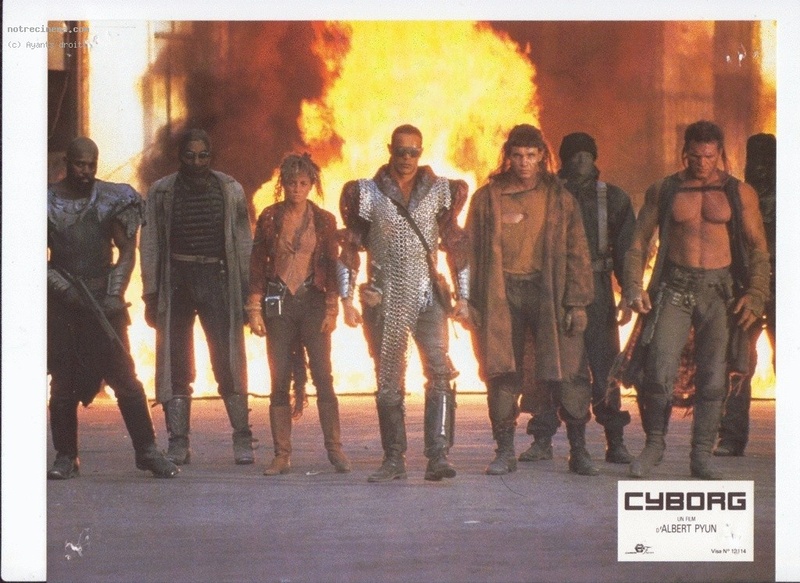 Cyborg, directed by Albert Pyun was a dark post apocalyptic adventure that quickly garnered a cult following and launched a cyberpunk sub genre of its own. Now more than 20 years after its initial release and with Pyun finally beginning work on an official prequel, Forces of Geek’s original Cyberpunk Big Mike Leeder The Man from Hong Kong takes a look at his original vision for the film, and talks to Pyun & producer Tom Karnowski about the project. In a post apocalyptic plague ridden world gone wild, a Cyborg (Dayle Haddon) holds the key to mankind’s future. 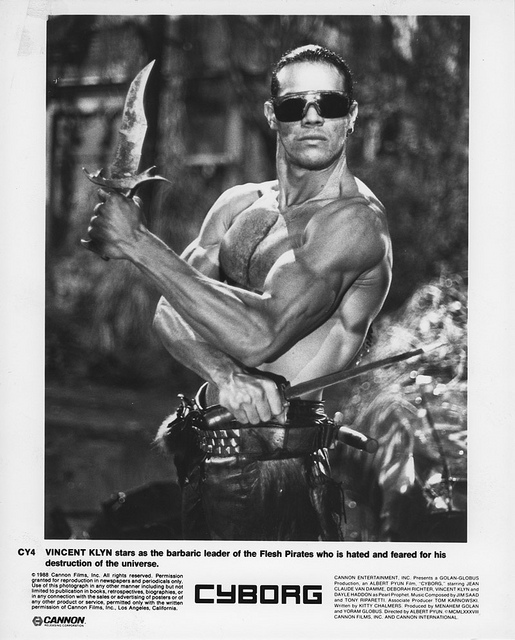 But when she’s captured by the crazed flesh pirates led by Fender Tremelo (Vincent Klyn), it’s up to a heroic slinger called Gibson Rickenbacker (Jean-Claude Van Damme) to step up and save the day. Cyborg wasn’t what I was initially expecting from a Van Damme movie circa 1989, but I really liked the look and feel of it. It’s also got some very nice action beats and I still like the way Jean-Claude fights in the film especially his earlier fights up until his crucifixion. The film did modest business at the box office but was very well received on video, but it wasn’t until much later that I heard that Albert Pyun’s original vision for the film had been compromised and that the release version wasn’t his, and I’d always wanted to see just what could have been. The film had actually begun life as a sequel to Masters of the Universe, and while I would love to have seen Jean-Claude wielding a sword and screaming ‘By the power of Greyskull’, for various reasons that wasn’t to be. By the time Pyun was able to get started on Cyborg, the original planned budget had been greatly reduced as sets/costumes, etc. designed for the other project were abandoned and Pyun and Line Producer Tom Karnowski had to work with their ingenuity and little else. Now Pyun has released his director’s cut sourced from a work print for people to take a look what he originally planned. Very Important: We’d just to make it clear, this is not a remastered pristine print we’re talking about, this is from a telecine, it’s not graded, picture size and quality change throughout the film, nobody gave Albert a Blade Runner styled renovation budget to play with before he put out this version. But while I do like the original release version of the film, I do really like the director’s cut and the way it expands upon a lot of ideas and elements in the film. We’ll be discussing the film and the changes and also talking to both Pyun and his producer for the film about the movie as we go. Big Mike: What happened with regards to the rumours that you were shall we say shut out of the editing room during post production? Albert Pyun: This should be put into context; Cannon was under tremendous financial pressure at the time. They were very director supportive and friendly, what happened really occurred because they were under so much cash flow desperation. After I’d completed my first cut, I saw a black and white dupe of the film while doling a temp mix for screening to Cannon’s execs. It was a black and white dupe used for the mix as a single reel of film to prevent the film breaking or splices coming apart as we’d roll it back and forth so many times. I fell in love with the B&W look and screened a heavy metal temp stereo mix and played back at 90db during the screening. As you can imagine the screening did not go well, they thought I was insane. So I quickly regrouped and screened a second cut that was closer to this director’s cut. This screening went good enough for the film to be tested, though they still had doubts about the direction I was headed with the rock score and pessimism of the cut. This screening was a disaster as the audience clearly wanted more of a Bloodsport than a dark, sombre, pessimistic film. In many ways I guess I was trying for more a The Road type movie stylistically, a mood piece. While the audience wanted more Mad Max or Book of Eli. After the results came in, I was told Cannon had a call from Jean-Claude Van Damme and he wanted to take over the cutting which they supported as he had done a great job or them on Bloodsport. So I left, getting this director’s cut rights in return. I would like to say that Jean Claude was very respectful and supportive throughout the process. He even started discussing with me directing his next film which at the time he called The Corsican Brothers. (This film would evolve over the years until it finally became Double Impact.) My cut is more pessimistic and internal. More gloomy sci-fi noir than the released action adventure…. Originally titled Slinger, the director’s cut starts with a darker tone immediately with Van Damme’s character already crucified and flashing back to what has lead him to this place. 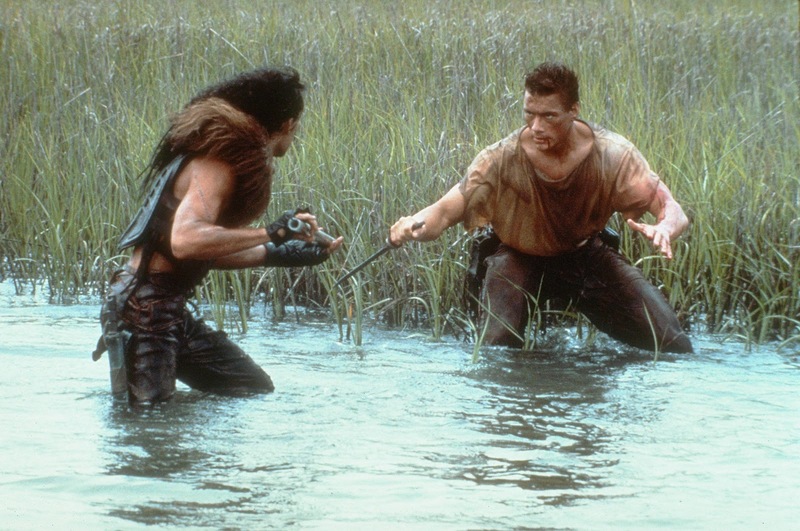 Note Van Damme is revoiced for the film, both for narration and all of his character’s dialogue. Now we all know the story of a lone hero fighting for the sake of mankind, but Pyun has a very interesting take on it. This isn’t the flashy future where we all wear colour coordinated jumpsuits, this is a literally dog eat dog plague ridden world, where violent death is far too commonplace. Aided by a bleak menacing soundtrack by Tony Riparetti, the mood is quickly set as we are introduced to the major players, a hero who lost everything and finds something to keep him going when he encounters the Cyborg, and the girl (Deborah Richter) who ends up accompanying him on his journey, a despicable villain who seems not to care that his actions will help plunge the world further into darkness aided by his motley crew of cut-throats, and the Cyborg who could hold the cure for the world’s troubles but knows she may have to sacrifice a few humans to get to where she’s needed. 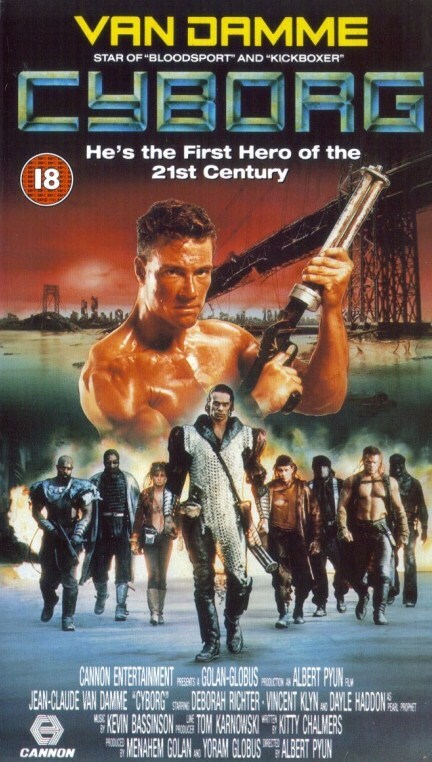 The performances of the cast are good, Van Damme plays the strong silent type well and there are a few moments of humour that work well including a scene where Naddy (Deborah Richter) who accompanies him on his journey offers herself to him, only to be politely turned down (he’s a far stronger willed man than I, Richter always cut an attractive figure as seen in Hill Street Blues & 80’s teen coming of age flick Hot Moves, where the young lady’s assets are showcased perfectly!). Van Damme was still finding his feet as an actor but does well with the acting, and especially in the action scenes with several very slick fight sequences where we see JC letting loose with some very impressive kicks including a great jumping kick involving his boot knife and some great hand work and weapons work, with some very nice camerawork that compliments the action and shows how well the man could handle intricate choreography. His dubbed voice works well, if you weren’t too familiar with his normal voice it’d barely register. And it’s interesting to look back and see the young man at work, bringing so much potential and physical prowess to the project while also displaying vulnerability in his performance. Former surfer Vincent Klynn (Point Break) who would go on to become one of Pyun’s repertoire company following this film, cuts an imposing figure and handles the action well, while his imposing glare and size helps him deliver the threatening performance his character needs. There’s ample support from Deborah Richter, while Dayle Haddon delivers an interesting turn as the Cyborg known as Pearl Prophet and Terrie Batson catches attention in her role as the woman Van Damme’s character loved and lost. 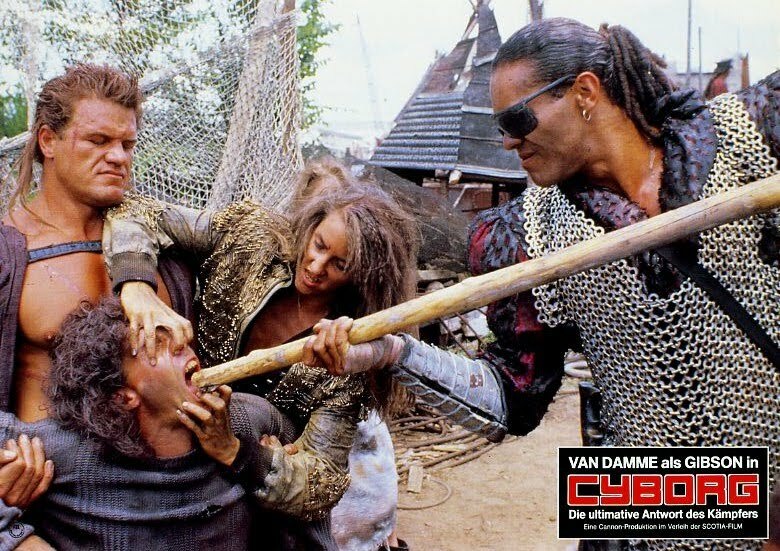 It’s also interesting to see a feral looking Rolf Mueller (Conan the TV series, Universal Soldier) turning up as one of Fender’s pirates who literally loses his head to Van Damme in a classic sequence. As we mentioned it’s a rough print at times, aspect rations, print quality, colours, grading and sound run through a variety of levels of quality during the running time, and while I really would love to see a re-mastered version of Pyun’s directors cut released perhaps along with his oft mentioned operatic cut and the release print on a fully loaded special edition (HINT, HINT MGM…think about it!). Come on MGM, we could make it happen! Work with me! My enjoyment of the film wasn’t affected by the quality of the version I was seeing, it brought back memories of watching classic Hong Kong movies & horror/cult films like Clockwork Orange, etc that were unavailable officially in the UK back in the 80’s, often sold by men in colourful tracksuits when a multi generation VHS was often the only way to see many of those films at the time. 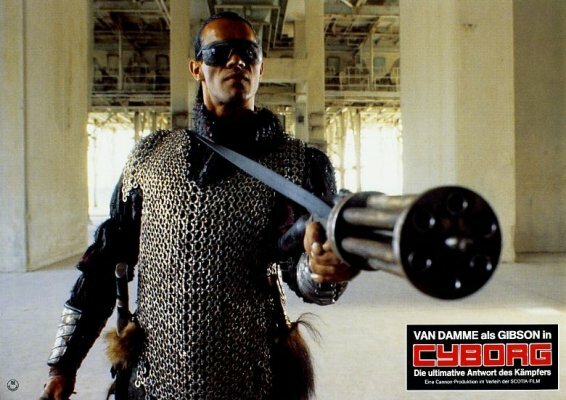 I was always a fan of Cyborg, it wasn’t perfect but I loved the feel of it and the ideas even before learning of an alternate version or a different vision, and have been a big fan of Pyun’s work since before this film, with Sword & The Sorcerer being a fave since back in the day. And it’s great to see his original vision and wonder what could have been if this had been the version released back in 1989. Big Mike: Can we set the record straight about the connection between Cyborg & Masters of the Universe 2? Tom Karnowski (Line Producer): Our background in making our own films for small budgets was actually a good fit with Cannon Films. Cyborg grew out of the original plan to shoot Masters of the Universe 2 and Spider-Man back-to-back. 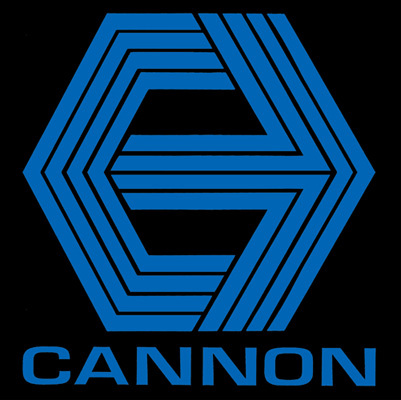 We prepped in North Carolina and had cast the films, made costumes and started building sets…2 to 3 weeks before we were about to start shooting, Cannon pulled the plug. It was a weird situation; I think it was a rights issue. We had crew who’d sublet their houses in L.A. for the shoot and now couldn’t go home, and had to stay in hotels. We proposed the idea of doing another project Cyborg, as a way to take advantage of the work we’d done in North Carolina and the stuff we’d been creating for the other films. The budget was low and they liked the idea as a vehicle for Jean-Claude’s second Cannon film after the success of Bloodsport. Big Mike: What was the hardest aspect of producing the movie and why? How do you feel that Albert’s original vision for the film was affected by the issues that arose during production and post? TK: As always it was tough producing the film for such a low budget, I can’t remember exactly how much we had, but it wasn’t a lot. We could have used more money for better visual effects etc, but we were really lucky to get the live action in the can for the money we had. Big Mike: Albert, It’s great to see your directors cut, but I had also heard you’d recorded a commentary for the film and that there was also another idea you had, for an operatic cut of the movie? I’ve also heard talk of a proper prequel or sequel to the film. What can you tell us? AP: The operatic version is the entire film in de-saturated B&W set to rock libretto, my audio commentary will accompany this release, and hopefully this will be coming out through MGM. There were two sequels that had nothing to really do with the original, and I’ve been developing a prequel/sequel that shows more of the genesis of everything seen in Cyborg, followed by a third act sequel which shows Fender’s body being recovered and turned into a monstrous Zombie/Cyborg hybrid. It would all end with slingers from across the country gathering in Atlanta to battle Fender. I’ve been talking to Michael Pare, Sasha Mitchell, Olivier Gruner, Vincent Klyn and Terrie Batson about the project, and they all seem very excited about the idea. We hope to do it this year, once we get the script right. Albert Pyun returns to the post-apocalyptic world of Cyborg with his latest project Cyborg: Rise of the Slingers which is based upon Pyun’s original vision for the film, and a first teaser has been released which hints at what’s to come. According to Pyun, the film will explore the whole singer brotherhood and the evolution of the Flesh Pirates and just who Gibson Rickenbacker was before the world went to hell, and how Fender Tremelo turned from being one of the original slingers into the sick and twisted flesh pirate we saw in the movie. Oh and we might even find out why the slingers are named after guitar makers! We’re not big fans of either of the ‘official’ Cyborg sequels, although Cyborg 2 does boast an impressive cast including Elias Koteas and the young Angelina Jolie some 2 years before her appearance in Hackers caught people’s attention. The least said about the 3rd one the better! Tom Karnowski would go onto produce several more movies in cooperation with Albert Pyun including Captain America, Kickboxer 2, Hong Kong 97, Nemesis & its sequels as well as work on such projects as The Illusionist, Max Payne, Season of the Witch & one of his most recent projects as Executive Producer was The RZA’s martial arts film The Man With The Iron Fists. Albert Pyun’s subsequent films include everything from Captain America, Kickboxer 2: The Road back, Bloodmatch, Nemesis, Kickboxer 4, Mean Guns, Tales of an Ancient Empire, Bulletface, Post Mortem and many more. He’s just begun work on Cyborg: Rise of the Slingers and has just finished post production on his semi-sequel to the classic Streets of Fire, entitled Road to Hell which sees Michael Pare returning to the screen as Cody one more time. For the latest info on Pyun and his films log onto the Albert Pyun Facebook Page.